Pets can be admitted to the flight only if special conditions are met. Cats, small dogs and some small animals you can take with you as hand baggage, provided that together with cage do not exceed 8 kg. Larger animals are accepted on the flight as checked baggage with special treatment (link Special baggage - this is an additional item within the menu Baggage and below items Checked baggage) during handling and loading. For more information about the conditions and limitations of pets and animals transportation you may contact the selected airline. Hand baggage, on entry into the passenger compartment, it must be put in luggage compartments above the seats or in a dedicated space under the seat, which leads to a limitation in size, weight and the amount of hand luggage. The general rule is that companies allow only one hand baggage dimensions of 56cm x 45cm x 25cm (according to IATA standards) and weighing up to 8kg. However, this limit may vary depending on the airline, class of transport, routes, tariffs and so on. Please make your hand luggage is in accordance with these rules. For further information you can contact the selected airline (link Airlines). Please repackage your hand luggage in accordance with the prescribed rules, before coming to us. Otherwise, upon arrival at a security control you will not be allowed to prohibited and improperly packaged items, solids and liquids take in the passenger compartment. All prohibited items or larger quantities of liquids than allowed will have to be disposed of in designated containers. For your comfort and safety, the airline may require to hand luggage, just before boarding, put on a trolley next to the aircraft, to be put together with checked baggage in the luggage compartment of the aircraft. Such hand luggage will be delivered immediately after landing,next to the aircraft in the destination airport. all other cabin baggage, when it comes to smaller aircraft with a lack of space in the cabin. The responsibility of passengers is to never leave hand luggage and other property unattended. Weight rule - whereby the passenger ticket determines the amount of baggage in kilograms, regardless of the number of items (eg . : a passenger in economy class transportation can deliver 20kg, while passenger traveling business class is entitled to a 30kg luggage). Quantity rule - whereby the passenger ticket determines the number of pieces of baggage, with some additional restrictions (eg . : passenger in economy class transportation may submit one piece of luggage weighing up to 23kg, whose overall dimensions (length + width + height) not exceeding 158cm). One hand over passenger luggage with a maximum weight of 32kg. If your baggage is not within the limits (weight, number of pieces, dimensions), the airline is entitled to payment of excess baggage.Please be informed when purchasing tickets on the stated rules and to prepare your luggage in accordance with the security restrictions and prior to arrival at the airport ( LIST OF PROHIBITED CASE CHECKED BAGGAGE ). For all the details you can contact the designated travel agency or airline. Due to the special safety procedure, you are required when checking in for the flight to register weapons and ammunition in checked baggage. Upon check-in, for each submitted passenger baggage you will get the luggage ticket that you are obliged to keep it until the end of your trip. The luggage ticket contains a bar code and the same information as the corresponding mark on luggage and used for identification of your luggage when you take it at your final destination. Lack of luggage ticket in case of irregularity with luggage (luggage delay or miscarriage) significantly reduces the likelihood of success of the search for the same. valuable bags, wrap in cellophane to protect them from wear. On checking-in baggage, you can register baggage which because of its size, shape and other characteristics require extra attention during handling and transport. Oversize baggage, animals, wheelchairs and toys, musical instruments, bicycles, equipment for skiing, diving, golf, etc. may be subject to additional restrictions. For more details you may contact the selected airline (link Airlines). Due to the special safety procedure, you are required when checking in for the flight register weapons and ammunition in checked baggage. 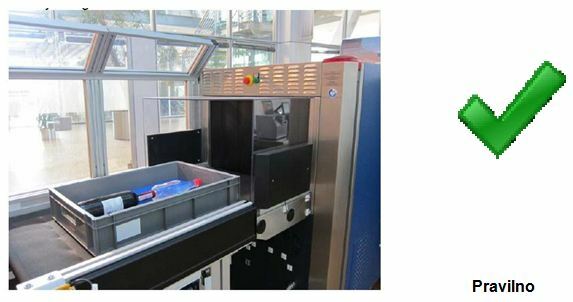 Oversize baggage, cages with animals and other baggage that due to its characteristics can not be transported by baggage belt are treated in a special way. Upon completion of check-in and luggage-tags hanging, it is necessary that luggage taken to oversized baggage compartment, which is located to the left further along the check-in counters. You shall, at the marked gates for the hand in of such luggage, wait for the arrival airport official who will take your luggage and take all procedures for its further security control, transport and loading on the aircraft. Luggage must not be left unattended until the arrival of our officers, because otherwise that luggage be treated as suspicious and be subjected to special security procedures. In case of loss of abandoned luggage Podgorica Airport can not be held responsible. The animals must be in an appropriate cage in order to be admitted to the flight as checked baggage.Upon completion of the check-in and putting tags for luggage, cage with the animal does not have to immediately submited for oversized luggage. However, you are obliged to do it no later than 40 minutes before the scheduled departure time of the aircraft (after the above procedure). In the case of mishandled your luggage, it is best to immediately with a plane ticket and baggage label sequence for checked baggage, please contact the clerk at the counter of the airport ,, Lost and Found ', located in the Arrivals hall, opposite the baggage belt in the extension of the red customs channel. Airport officer will immediately request a re-checking of the luggage from the aircraft and baggage flow after unloading the aircraft. In case that even after these checks, the luggage is not found airport officer will fill in the form on non arrival of the luggage in order to electronicly monitoring and baggage tracing. To search yielded faster and more effective results, it is necessary to know the basic characteristics of baggage, such as type, manufacturer and color. After compiling the form on non arrival of the luggage airport officer will issue you a copy of the form, depending on the airline you can choose to be notified of baggage (tel. Call or SMS). In the case of the found luggage and the receipt of damaged or stolen luggage Podgorica Airport provides services for assistance when making the appropriate records and to educate passengers with the rules of the airline in case of receipt of damaged or stolen luggage. To retrieve baggage you must come in person (if your carrier does not provide for the delivery of luggage) to the warehouse ,, Lost and Found ', located in a commercial building at Podgorica airport, which is a tunnel connected to the passenger building. In order to take luggage, and the identification of the owner, it is necessary to show the passport (or identity card - only for the citizens of Serbia) and pay certain fees if needed by customs regulations. After arrival the baggage can be taken also by the family member with the above-mentioned documents from passengers and with their identity documents and key if luggage is locked. For more information about fees and the customs regime. If the selected airline provides delivery of baggage, your luggage can be delivered on a temporary or permanent address within the territory of Montenegro with the regulation of customs formalities on your behalf. Opening hours from 07 am until the last of the planned landing of the aircraft on arrival.